"The market for castles in upstate New York dried up completely." 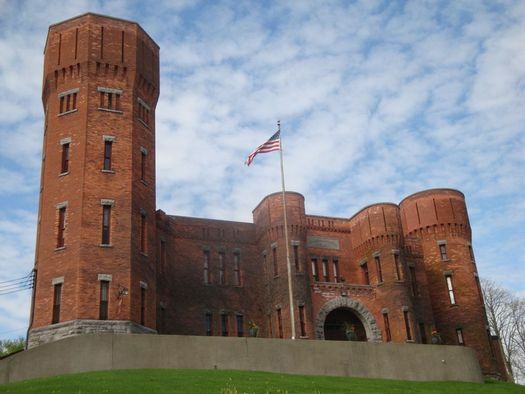 It's actually an old armory. But it's castle-like. In the end, people can find a million reasons not to buy a castle: Some have complained that there is not enough parking, others would prefer a castle that is deep in the woods. The fact is, the only reason to buy a castle is that you have a terrible yearning to live in a castle. "It's the supercool factor," Ms. Phemister said. The list price for the castle is now $895,000 -- down from $1.25 mill last fall. The Phemister's bought it for $800k in 2005. Akum and her family stayed in the castle in 2011 (lots of photos) -- the family operates a bed and breakfast there. It's sort of a come-for-the-castle-stay-for-the-taxidermy situation.